It’s an easy joke to make. When there’s another mass shooting, or Trump leads in the polls, or the wrong movie wins Best Picture (remember Crash? ), or Trump is an official nominee, or Trump is the actual President(! ), it’s funny — kind of fashionable, even — to announce that you’ve had enough and are moving to Canada, or Amsterdam, or Australia, because the country has finally gone insane. At what point does the joking stop? At what point do you start seriously considering leaving your home country because you’re scared for your kids? It used to seem absurd, the idea of living anywhere else, the idea of raising children anywhere else. It probably still seems absurd to most Americans. But with a new shooting nearly every day, things have moved past absurd and into surreal, and no one seems able – no one seems willing – to do anything about it. Someday soon there may be nothing left to do but leave. I’ve spent some time abroad; in Canada (a popular destination for those threatening to defect), in Europe. It’s always been on a vacation of some sort, and I haven’t spent a ton of time there, so I can’t pretend to know what it’s like to live in those places in a real-life, day-to-day way. But neither can I pretend that America is (still?) the Greatest Country on Earth. The opening scene of the otherwise mostly execrable “The Newsroom” covered that ground pretty well. Every place has its pros and cons. Every country has its own politics, its own personality, its own peccadilloes. Again, I’ve never lived in another country long enough to know what it’s truly like, but I know that there are some policies in other countries that might, in some way, make life a little better. Maybe a little safer, and definitely a little different, but probably not that different. Not in the important ways. There are countries with longer, stronger maternity leave. With actual paternity leave, and better healthcare. 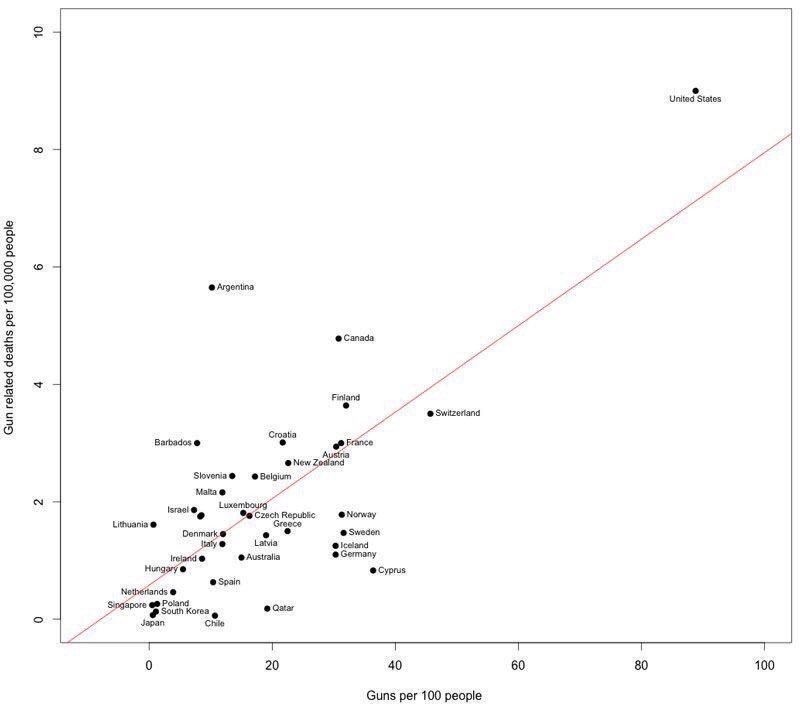 Real gun control and better educational systems. I’m assuming there are at least one or two regions with a little less political divisiveness. And there must be an oasis in a desert, or a hut in a jungle, or an igloo on a glacier, where lobbyists have less control and influence, where corporations aren’t treated as people, and companies aren’t given free rein to pour money into politicians’ pockets at the expense of everything but their agenda and their profits. Someplace where people are less worried about sending their kids to school or taking a walk past a Planned Parenthood or selling loose cigarettes. I’m willing to have fewer cheeseburgers if it means fewer school shootings. The sad thing is, it’s not the violence that’s most worrisome. There are plenty of more violent places to live, and there’s simply no escaping mankind’s impulse for conflict, no matter what country you call home. It’s the inaction and the indifference that are most troubling. It’s the way the people meant to represent our interests are more beholden to their coffers than to their constituents. I don’t pretend to know what the real, or the root, problem is: guns, mental illness, racism, inequality, the constant vitriol on cable news that seems to inspire unspeakable acts, all of the above. There are a lot of possibilities. But I do know that very few of our so-called leaders seem interested in paying anything more than lip service to trying to solve it. Just yesterday – YESTERDAY! The day after the San Bernadino shooting! – the Senate voted against expanding background checks for gun purchases. I shouldn’t be shocked. If the massacre of a room full of kindergartners can’t effect even the smallest bit of change, what hope do we have? It used to be unfathomable to consider leaving this country, even when you’ve already seen through the myth of American exceptionalism. But after the 352nd mass shooting in 336 days, what’s more unfathomable: being a so-called patriot and having faith in your country, when the rich keep getting richer and the inequality keeps growing and the death toll keeps climbing and no one has anything to offer except prayers? Or raising young children in an environment like this? Our children aren’t conservative or liberal. They don’t hate Obama or love Ted Cruz. They’re just kids. Stop picking sides and start doing something. I have one young son and another on the way. It’s too late for me to go back on my decision to bring them into this already scary world. But with every new homegrown tragedy, I get closer to making the decision to take them out of our increasingly scary country. I don’t want to leave the United States, and I have no plans to go anywhere. But for the first time in my life – because of my concerns for the safety of my children and my utter lack of faith in our politicians – it’s suddenly not out of the question. Great share and came at a great time. My daughter is 20 years old and has been telling me for the past 6 years that she doesn’t want to live here anymore. At first I shrugged it off as a young girl just being adventurous and a bit dramatic but now every day I turn on the tv I literally can’t imagine staying here myself for much longer. It has become scary thought for sure. The Senate voted down an amendment to a bill, proposed by Senator Feinstein of California, that would have allowed the government to bar sales of weapons to anyone the government suspects of being a terrorist. On the flip side, the Senate also voted down an amendment that would let government delay firearms sales to suspected terrorists for up to 72 hours. Under that proposal, the transaction could be halted permanently during that waiting period if federal officials could persuade a judge to do so. So basically, the Senate voted to continue to do nothing. The kicker, though, is that neither amendment was going to go any further anyway, since the legislation was attached to a bill eliminating most of President Barack Obama’s health care law, which is certain the President would have vetoed anyway. The only way anything will get done is if everyne currently serving in Congress is voted out of office and new Congressional Representatives and new Senators are put in who will do something for their constituents. And we all know that is not likely to happen. You stated more than once that you have never lived anywhere else. That is a good point. It seems that before leaving this country you may want to go live somewhere else for a trial period. I beleve that you may view this country a bit differently when you return. Yeah. Mostcof Americans I’ve met who’ve lived/are living in other counties have an wven more jaundiced view of the States than those who have never lived elsewhere. An a shocking percentage of the ones I’ve met never want to return ‘home’. We live in Australia where the gun laws are strict. Hearing someone shot someone is extremely rare. I love it here and couldn’t imagine raising my kids anywhere else. Like you I’m a born and bred New Yorker who worries about raising a child in this increasingly insane environment. The violence is an issue but the indifference and lack of political will to change things is a bigger one. Although I’ve spent time in Canada and used to have many clients there I don’t see myself relocating. I just hope we all come to our senses and realize we have a problem that needs resolution. I just don’t see it happening anytime soon. Hey. I understand where you’re coming from. We’re Americans who are living in Madrid for a few years. I am genuinely worried about bringing our, currently four year old, daughter back home to DC. The idea that my child will have drills on what to do if a terrorist,(because what else do we call all of these people committing mass shootings), comes into her school is terrifying. I’m an American and have lived in Australia for the past 14 years. I became a dual citizen in 2009. Every year I become more and more thankful that I live in Australia and am able to raise my two young children here. I don’t have to worry about them being shot at school or in a shopping mall or movie theater. Americans are becoming less and less free everyday. I miss being near my own parents and siblings but for my own sanity and for the safety of my children I will never live in the USA again. Unfortunately, all the focus on this last mass shooting is going to be on the fact that the perpetrators were Muslim. Not that they were able to use a loophole to buy assault rifles in California. I have a 3 and a 6 year old, and only recently have I started to really worry about their well being. I really used to believe in the right to bear arms, even though I don’t own any. But lately I’m rethinking the right to have any guns. Civil liberties sure, but I should have the civil liberty to send my kids to school without worrying about them being shot. I agree 100%… and for the first time and glad to have married a Canadian and have two kids who are also citizens. I could have written this myself. Great post. A question for those living in Australia: I’ve always understood that, as an American, my chances for establishing residency there are slim to none. How did you do it? That us definitely my refuge of choice should the 2016 election go the way of the unthinkable. Given the list of options provided, and apparent elevated concern over mass shootings in the article; I’d go with the vitriol on cable news as the culprit. Assuming the number of mass shootings listed in the article is correct, that’s a little better than one a day, and the majority of those are likely domestic, murder, suicide type events. To put things in perspective, people don’t win the lottery nearly that often. I wonder if the arthor lives in fear of being inflicted with sudden wealth? The media does hammer on those stories though, so I suppose it’s understandable that there are people living in constant fear that there’s a mass shooter around every corner. It is interesting to note the differences in concerns people have though. While I’m not an enthusiastic Trump supporter; the only time I ever toyed with the idea of leaving this country was under Obama, and I have lived about 16 years of my life outside the USA. I think, ultimately, we’re all better off staying put and sorting this mess out. And it is going to require an awful lot of sorting out. Im hoping this movement for a constitutional convention of states is ultimately successful. It’s the only path I see toward compelling the federal government to bend to the will of the governed, as it should.